Childhood is a time of innocence and exploration, but in today’s busy world it can take an effort to create the time and space for our kids to just be kids. 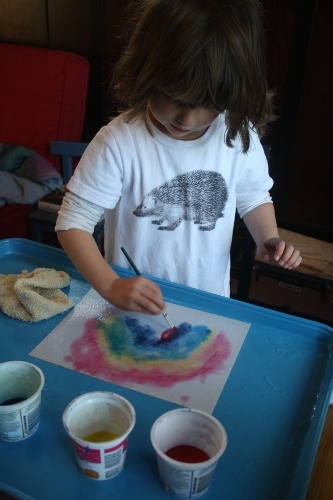 Waldorf philosophies and playthings are usually appealing to parents who want to nurture attachment, empathy and creativity in their children, who believe that kids need structure and rhythm in their days, and who have an affinity for well-made materials from natural sources. In my first post I talked about the ways we have incorporated Waldorf into our homeschool experience, including natural toys, daily rhythms and creative play. Today’s post explores three more elements of the Waldorf philosophy, folk tales, music and art. Waldorf teachers use storytelling in the classroom setting to introduce concepts and start the day’s lesson, working from the strong oral traditions that have been the norm for the vast majority of human civilization. The stories are often traditional folk and fairy tales, and they’re not always the cleaned-up and politically correct versions that are told today. While Waldorf philosophy does encourage telling age-appropriate fairy tales to avoid scaring little kids too badly, the stories do reflect on morality and character and are often as close to the original versions as possible. In our house, we have a copy of The Random House Book of Fairy Tales that we read from and enjoy. There are beautiful illustrations and while the stories do have a bit of gore and scariness in them, I still far prefer to read the original version of Cinderella than the cartoon Disney version. We’ve also really enjoyed The Hidden Folk by Lise Lunge-Larsen, which is has perfect mix of sweet and devious characters. It is a good introduction to the various types of hidden folk, including Nisses, Selkies, Fairies and Dwarves, and it has stunningly gorgeous woodcut illustrations on every page. Music and rhymes help kids learn the nuances of language, the pleasure of word play and are a fun excuse to dance around the dining room and get a bit silly. Traditional Waldorf classrooms teach children to play the recorder or kinder lyre around age 6, but enjoying music and rhyme at home can be simple, inexpensive and fun. We like to sing lots of the standard nursery songs, especially the ones with fun actions that go along with them. Head and Shoulders, Roly Poly, the Eeensy Weensy Spider and Zoom Zoom are classic songs we’ve learned (or relearned) at our neighbourhood baby drop-ins and library storytimes. We also like to read poems and rhymes aloud, especially Where The Sidewalk Ends, A Child’s Garden of Verses by Robert Louis Stevenson, and a new library find, Read-Aloud Rhymes for the Very Young. Making things is a great way to foster creativity, teach practical skills and improve hand-eye coordination and fine-motor dexterity. Waldorf is a great approach to education for kids and parents who love to do crafts and artwork, and this is one area where I will admit that it’s worth it to spend the money on good quality materials. The difference between doing watercolours on leftover printer paper with a box of Crayola watercolors and painting with thick watercolour paper and artist quality tube paints is quite remarkable. 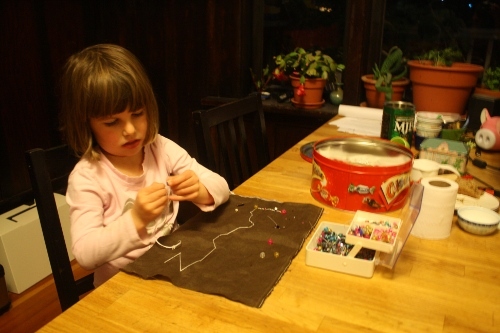 While my girls are both too young for some of the more traditional Waldorf handwork projects such as finger knitting, Bea has just started experimenting with embroidery and beading with great success and enthusiasm. We also recently tried wet-on-wet watercolours by using this tutorial, and both the girls and I enjoyed playing with the way the colour seeps through the thick paper. As with many other parenting philosophies, educational approaches and discipline techniques, there are parts of Waldorf that I don’t subscribe to fully, such as the need to delay all academics and reading until age 6, a total ban on computers and TV or the specifics of eurhythmy. But overall, the elements of Waldorf that we do enjoy at home are fun and accessible for both my toddler and preschooler, easy to incorporate into our day and bring a little more peace and creativity into our home. I hope these two posts have given you some ideas that will work in your home too! Now I’m curious! What Waldorf-inspired activities, toys or celebrations do you enjoy at home? The same thing happened with Waldorf. I love natural toys, experiential learning over direct instruction, going out in nature A LOT, baking, being gentle, gardening with my babies (well, toddler and 6 year old). But I had read You Are You’re Child’s First Teacher and was dissapointed by the jargon, new-age culture, and lack of specific activites, versus, a sample day, etc. I was like, Naw, Waldorf isn’t for us…maybe Reggio Emilia or something. But my husband went throug his doctoral program with another teacher who happens to be a trainer of waldorf teachers. So waldorf just stuck around in our realm. Now I’ve read more about exactly how waldorf looks throughout the day and year (thanks to blogs like yours!) and, of course, we are doing a lot of it!! I think I’m just going to give myself up to the forces of the universe from now on. We recently made Dragon Bread (my son has been wanting to do it for at least 2 years), but didn’t read the stories that go with it. Next year I want to plant marigolds in spring and use the flowers to dye silk capes in the autumn. And make a sword since my boy will be 7. I am also going to write my own story about the dragon and incorporate the turning of autumn into it. In the next few days we are going to re-read the story of Persephone, and eat our ripe pomegranates from our garden. My husband built a play stand 2 years ago (it was simple, but took time) and our children love it. I have baskets from Ikea & Trader Joe’s containing pine cones we gathered at the park (it was raining that day, and dried them in the oven @ 200 for a few mins), branch slices from eucalyptus, play silks (scarves I bought online and dyed with food coloring, tutorial from another blog), play cloths of cotton gauze from the fabric store, and some hand-made cloth animals we have hand-sewn according to our son’s specs. I think our biggest score (from an estate sale) is a large set of wood animals (they look like amish toys) hand made in the 1940s by a daddy for his little girl who grew up to be a teacher and used them in her own kinder classes. Love it!